I have a couple of activities that I thought I would share with regards to enjoying the wind. 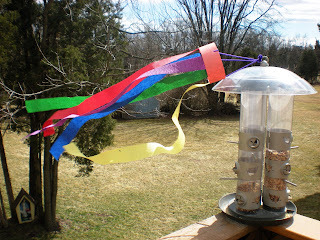 For me, if you are going to make something involving wind, you have to have streamers. All of these projects include streamers. 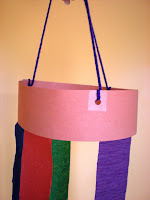 Check out the great kite/windsocks over at preschool daze--as always, a great project. 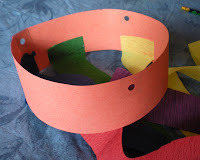 Take a 12 x 18 piece of construction paper and cut a strip 2 or 3 inches wide. Then let the children cut or have ready, strips from different colored streamers. Have the children glue the streamers onto the strip. Put glue on one end of the strip and glue it together to make a circle. I put three holes spaced as equally as I could get them, in the circle. Before I punched the holes I put a piece of tape in the area, just to reinforce the spot. I then tied on a piece of yarn. After the yarn was tied to the holes, I gathered them together at the top and tied them together. My windsock has no theme or decoration, but it is very easy to apply this. For example, I thought mine looked very rainbow like, you could have the children color, paint, etc., a rainbow, cut it out and glue it to the strip. Or, you could decorate the strip with different items, say sequins to sparkle in the sun. There are many possibilities. I hung mine outside, although it would have to come in at night and on damp days. 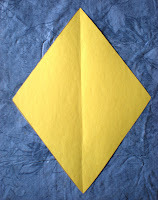 Fold a piece of construction paper in half and draw half a kite. 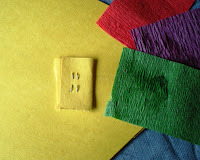 I like to do this type of cutting activity with children. It helps portray symmetry and it never ceases to amaze them that even though they are cutting half of something, when they are done they have a full-sized object. Let the children cut on the lines drawn. 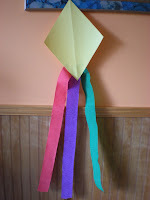 Allow them to cut some streamers for a tail and glue them to the bottom of the kite. You may let them decorate the kite anyway you like. Finally, if you would like, you can add a string. Children love to take these outside. I used a piece of scrap paper from the kite cutout and folded it up. Then I took a piece of yarn and knotted it several times. I then stapled the string to the front of the kite, but made sure it went into the folded paper on the back. I thought this might reinforce the area. One mistake I made, I stapled the string near the bottom of the kite. You should probably staple it closer to the top so the kite isn't upside down all the time. My final project was just a little wand for outside fun. There isn't much the children can do, but they will probably enjoy this outside. Let the children cut some streamers. Put them together and fold them over the end of the straw. Then staple them into the straw. The tricky part was making sure I actually stapled into the straw. Enjoy, but don't blow away! I think the girls would like dancing around with the streamers!! I think my oldest will be studying wind in her weather unit next. We love flying kites and have a really big one with streamers that we take out on the beach. Bought it years ago when we didn't have kids. So fun to share with them last summer. Very colorful and visual. Thanks again for another cool idea! Thanks for reminding of this activity. Our Preschoolers will love it! !